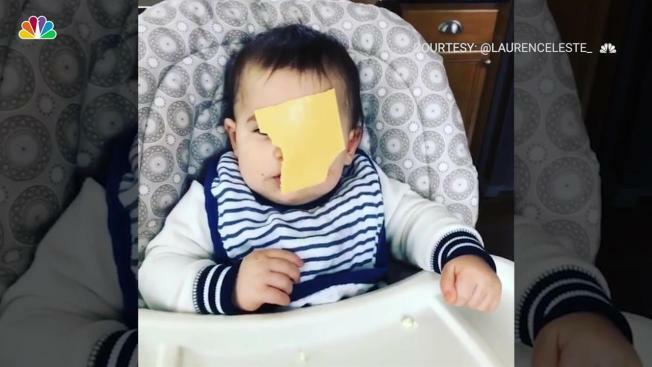 A bizarre social media trend swept the world over the weekend: throwing slices of American cheese at babies’ faces and posting their reactions. The prank, which is accompanied by the hashtag #cheesed, was started by @unclehxlmes on Twitter where he “cheesed” a baby in a since-deleted Tweet. Some have cheesed their moms, dads, girlfriends or dogs instead, with the dogs definitely more receptive to having a piece of cheese thrown in their faces. In the case of the babies -- some smile through the cheddar, some try to eat it, and others look visibly confused. Certain #cheesed videos of have garnered hundreds of thousands of views on Twitter and Instagram. Children's Rights executive director Sandy Santana cautioned parents about the challenge, but said it didn't amount to abuse. Model Chrissy Teigen was unimpressed with the challenge, and posted her opinion to Twitter. “I love a prank as much as anybody, but I cannot get myself to throw cheese at my adorable, unsuspecting baby who has all the hope and trust in the world in me," she said.